The river Hvitá in the southwest, forms the outlet of Hvítar- vatn, and receives immediately below the lake, the waters of Jokulkvisl, which has a rapid current and an abundance of water brought down from the Kerlingarfjoll watershed, where it will be remembered we crossed on our way from Grananes. Several other tributaries from the west join it further down, so that Hvítá becomes at once a deep and rapid river, which as a rule cannot be forded, also on account of its bed, which like all glacial rivers, is soft and changeable. In olden times, not far below the lake, there was a very difficult ford "Skagfirdingavad". It had however been impas- sable for some years, and in order that the shepherds could cross from the parishes in the Geysir district to the country east of Hvítárvatn, where they curiously enough have »Afrjett" (grazing rights), boat-building materials were transported right up Hvítá's head at the lake, and two boats were built, which did good service for a long time. We however found them in such a leaky condition that they were unusable, and had therefore to essay the ford. We broke up our camp on the east side of Hvítárvatn the 17th August, and rode away from the beautiful green pastures over the flat swampy ground towards the ford. After one and a half hours ride we reached a Sosluhus, which lies on a low hill close by where the boats crossed at the point where Hvítá bends to the east. As we were unacquainted with the exact locality of the ford, we had to search for it. Our attendants, especially Magnús, were remarkably smart and daring; several times they tried in vain, but it was too deep and the horses sank in. At last however they succeeded in finding it. About 500 yards southeast of the Sæluhús — down stream — one rides down a declivity out to quite a small holm and from this to a second and third — still keeping not far from the left bank. From this last islet one swings across the stream (rather a little against than with it), to the north end of a small island, and from this against the stream to a large island, and so to the other bank. The ford is far from safe, for only a yard or two to the side lies a soft bottom and quicksands. Magnús for instance went head first over his horse through its forelegs sinking in suddenly. How he saved himself I dont even now quite understand, but in a trice both he and his horse were up again. His arms had been so deep in the quicksand, that it had gone up his sleeves from his wrists right up to the shoulders. Shortly after I myself got too far to one side, in mid- stream, and my horse began to swim down stream. Magnús saw it happen, and driving his heels into his horse was beside me in a moment, while the water splashed up on all sides around us. Although there was no great danger, I shall not easily forget the great promptness with which he came to my assistance. It was characteristic of the man, he had here, as always, his eyes about him. I had however got wet and had to change my clothes, and as it was raining, we pitched our tents immediately beyond the ford, and remained here until next day. 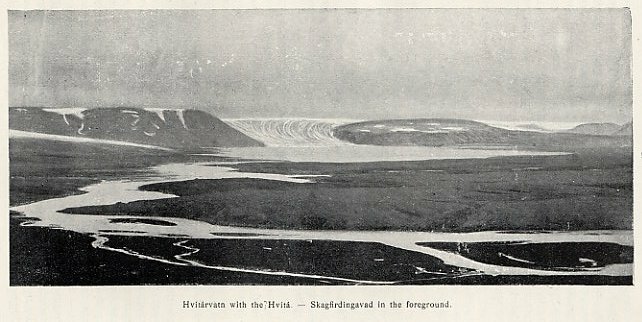 From the top of the aclivity on which we were camped, we enjoyed a wonderfully beautiful prospect over the jökull with its glaciers, the lake, the plain, and Hvítá, which flowed in a whitish serpentine sweep along the almost black, dusky, stony plain, ,"Hvítárnes" (Plate III). The next day, the 18tt1, we rode on towards Geysir, after first having marked out the ford. The boats however have since been put in order. From the fording place we rode along Hvítá to the south, passing east of "Bláfell". It is also practicable to ride west of this mountain, whereby the swampy ground between it and Hvítá is avoided. Nearly the whole landscape between Blafell and Geysir is an undulating desolate sandy and stony plain, where the soil has been washed away by the rains. Here and there stand small earth and sand knolls with a little vegetation on their tops, the remains of former splen- dour. The landscape was however beautiful in spite of its disconsolateness. Hvítá growled and foamed in the cleft on the left. On the far side we saw the territory I had traver- sed in 1897. Here lay a number of farms in the middle ages, but now all is deserted and desolate. On our right was Lang- jokall with its detached foot hills: Jarlhettur. After 8 hours ride through this most desolate waste, we reached Gullfoss, the vapours from which had been visible for some time. This waterfall is one of the sights of the whole tour. 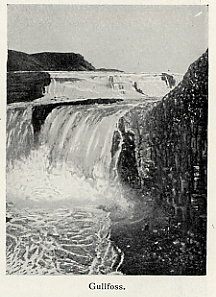 Hvítá flows here above the fall between comparatively broad banks, and then is suddenly narrowed and falls into a deep narrow chasm between the basalt stratum, whence the water is sucked aloft like fine dust particles into the air. From Gullfoss to Geysir is one and a half to two hours ride. The country is a little swampy, and it is not always easy to find the way, but we are now again in inhabited parts with a little farm here and there, and one can, if desired, ob- tain an extra guide in the form of a boy or girl from one of these, who is mounted in a trice ready to lead the way. 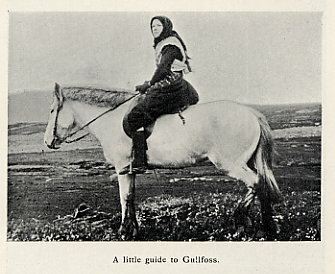 On the whole it is often just in the peopled districts that it is especially difficult to trace the way, because there are so many small bridle paths, none of which are distinguished in any way, so that one often is misled, We descried the vapours from the Geysirs on the far side of the Tungufljót and crossing this ford, which is not always to be depended upon, were soon at the foot of Laugarfell with its twenty odd steaming springs among which the grand magnificent Geysir. The slope at the foot of the hill is strewn with reddish-yellow silica, sand and clay. We camped at the usual spot just south of Geysir, where there is a little grass. 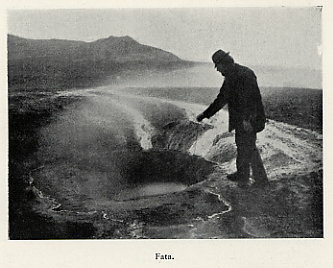 The Geysir springs are located on ground previously belonging to the farm "Laug", but now owned by an Englishman, who however, has not been heard of since the purchase. 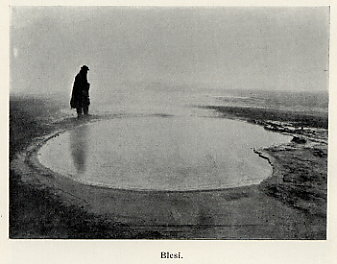 This was my third visit at Geysir, and I have been there once since in 1905. The first time was in 1896, fourteen days before the earthquake, and I was there again the next year, so that I could observe the changes that had taken place under the earthquake. 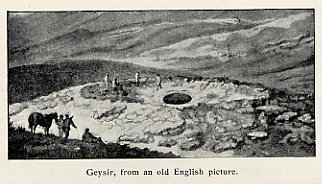 Geysir, from an old English picture. in a moment here in the south. — On the morning of the 27th August severe shocks were again experienced, which completed the destruction. In the days from the 27th Aug. to the 4th September, the earthquake movement continued with slight shocks and minor concussions all the time, so that the people in the affected districts lay in tents at night. 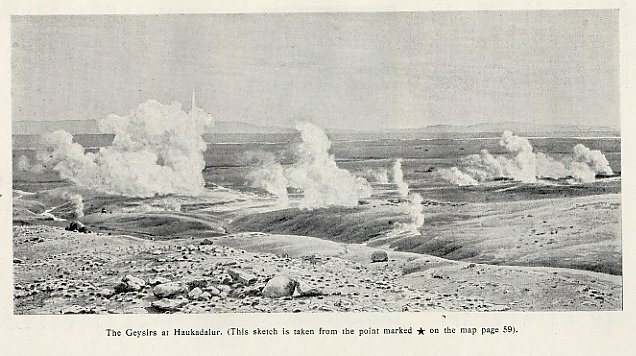 The 5th Sept. at 10-30 in the evening the south country was again shaken by a violent shock, which lasted about a minute and destroyed over 100 farms in Floi. The mountain sides were enveloped by dustclouds from the countless hill slides, which plunged down with such earsplitting roaring and booming that people could not hear one another even when shouting. 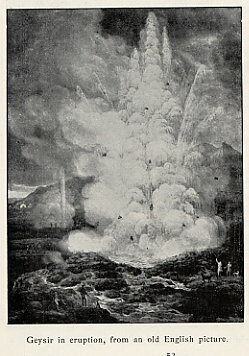 Geysir in eruption, from an old English picture. The same night at 2 oclock came a still more frightful earthquake, the most severe of them all. In scarcely half a mi- nute 30 farms in Olfus lay in ruins. This night the shocks were so violent that no one could stand upright, and the people stretched themselves on the ground clinging fast to rocks and tussocks. The shocks were accompanied by fear- ful boomings and terrible crashes, while the earth rocked like being tossed in a high sea, and to increase the horror of it all, the bells rang as if for a funeral. A little guide to Gullfoss. The great Geysir in eruption. vary greatly, the shortest I have observed being about half an hour. The single springs follow often immediately upon one another, in such a manner that before the first is finished a second commences; but again just as often there is a moment's quiet between two jets. — Geysir had, in the beginning of the 19th century, an eruption once or more in twenty four hours, but gradually their frequency decreased, until shortly before the earthquake in 1896, at which time it only spouted about once every five days. Geysir activity was at once increased but is now again on the decline. not more than that we could use it to our tea. In the east outlet from Blesi lies a new spring called Stjarna (Nr. 4), which has also risen since the earthquake. Is is said to have spouted a few times, and a rumbling boom is heard from two small holes 5 feet deep. Nr. 6 ,,Fata" (Bucket), is a little spring 13 feet by 9 feet wide and 2 feet deep, where the water sometimes sinks so far down that it cannot be seen. 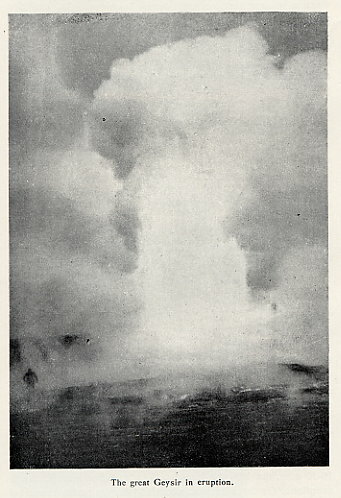 Nr.7, Strokkur (Butter churn), arose under an earthquake in 1784. Previously it boiled up to the brink, and could generally be made to spout by plugging its mouth with turf, but it is now quite inactive, and only contains dark tepid dirty water, which froths up at long intervals, giving a subsequent higher water level. The throat of the spring sinks into the depths abruptly from the ground level. The socalled "Little Geysir" or Otherrishola (Nr.8), springs to a height of 12 to 18 feet several times daily from two small oblong deep holes, about one foot long by from 5 to 10 inches, surroun- ded by red clay. Little Strokkur is a well (2 feets wide) which boils vio- lently. Near it lie a similar smaller well with yellow water, and some blue-grey sloughs, one or two of which spout a little. dry before the earthquake, but after this they burst up again. The largest are Sisjodandi, (constantly boiling) Nr. 13, which seethes up about one and a half feet; and Nr. 12, which still spurts to a height of about two feet. In several places, especially by the outlet from Little Geysir, are sloughs and mud pools with red, blue, or reddish yellow water or deposit. They bubble with a grunting or sputtering noise. Tourist accommodation has now been provided in a tourist hut close by the Geysir springs with good beds and catering during the summer. 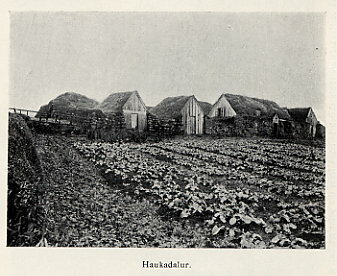 In the neighbourhood of the Geysirs lies the farm Hauka- dalur-with a. chwch. The farm is one of the farthest from the coast in Iceland. 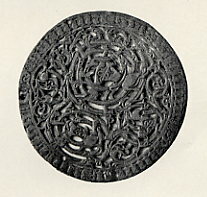 On the church door is a round plate with a ring to which various legends attach. The plate is however perhaps an old saddle ornament. In olden times Haukadal was a chieftain's seat, and the re- nowned Haukadal family, which played such an important political part at the close of the commonwealth, originated here. On this spot Are Frode, the father of Iceland's histo- rical literature, spent his young days. From Geysir we rode the usual way to Thingvellir in about 10 hours and from there to Reykjavik.